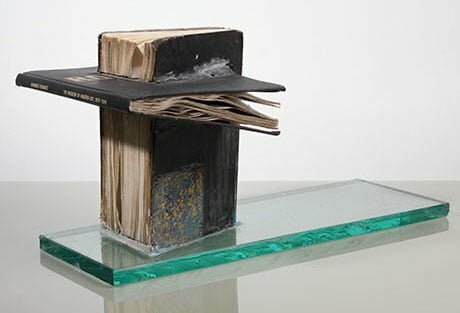 The Henry Moore Institute’s latest exhibition, A Lesson in Sculpture with John Latham, seems to function less as a lesson and more as a conversation between him and the other artists whose work is shown alongside his. This intergenerational conversation has transcended time – allowing John Latham to converse with Katie Paterson as she also engages in discourse with Marcel Duchamp. We, the viewers, have been granted the wonderful opportunity to be privy to their exchanges echoing across the gallery.The exhibition itself is timely, with this year being the 10th anniversary of Latham’s passing. As you make your way up the Henry Moore’s awkward steps, your immediate view is of Latham’s Little Red Mountain standing sentinel just behind the glass door of the first room. This black and red (and maybe read? But who knows if he had) imposing mountain of maimed books is typical of his work; his dislike for books was well known, especially from his most notorious piece where he distilled the ‘essence’ of Clement Greenberg’s collection of essays, Art and Culture, subsequently seeing him removed from his teaching post at St Martin’s School of Art. His work is carefully collocated with that of 13 other artists. ‘But wait’ I hear you say, ‘aren’t there 16 artists in the exhibition?’. Well spotted, dear connoisseur of culture. The work of Neal White, Annea Lockwood and Gordon Matta-Clark with be live pieces at one-off events Skoob Tower (Skoob being books spelt backwards), Piano Burning and Garbage Wall respectively. Works like Inventory by Carey Young – a piece of vinyl noting how much the chemical make-up of the artists body is worth accompanied by a breakdown of each chemical and it’s worth in GBP sterling – and Katie Paterson’s Timepieces (Solar System) – which consists of a series of clocks showing visitors the passage of time on Earth, the Moon and several other planets such as Venus and Neptune – are also cleverly curated in this exhibition. The exhibition has a very skyward feel, especially with other pieces, such as Josiah McElheny’s The Centre Is Everywhere mirroring constellations in the night sky, if both the sky and his sculpture were viewed from below. Even the work by Marcel Broodthaers and Mary Kelly, while being made of the materials of the earth, form piles reaching and pointing ever upward. The Henry Moore Institute have once again delivered to Leeds a show that is of intrigue and delight, an exhibit that asks us to partake in a wondrous conversation not to be missed.